There is a new microchip technology that is helping to preserve Brazilian rain forests by identifying the size and location of trees, and even who felled them. This allows the authorities in Brazil to know whether the tree was felled in accordance with sustainable forestry practices or if it was cut down through illegal logging, which destroys large areas of the Amazon rainforest every year. Some experts believe that this new microchip technology can aid Brazilians in their battle to preserve the rainforest and cut back on the greenhouse gasses emitted by felled trees. Similarly, such technology may also be able to preserve the existence of orchids that are also in the rainforest. There are many species of orchids in the Amazonian rainforest, admired for their beauty and their strong aroma. 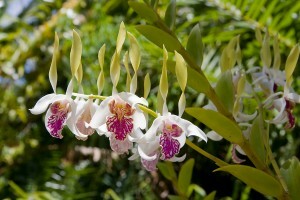 These species include the Dendrobium, Cattleya, Maxillaria, Epidendrum, Oncidium, Encyclia, and Gongora species. They thrive in this environment because they can live for a long time without outside help. Furthermore, their roots are able to quickly absorb water and nutrients, and their secondary roots can retain water for long periods of time. The wind in the rainforest carries their tiny seeds all over the area, so there is no question that the orchids have a perfect home in the Amazon rainforest. This is why the microchip technology is also vital to the orchids. If the Amazon rainforest continues to be destroyed, it will affect many plant varieties that are native to the rainforest, including the orchids. Virtually all orchids require some sunshine (some more than others), water, and a great deal of humidity. If trees continue to be lost, the environmental impact it could have here could be very devastating to the many species there, including orchids. For the orchids, fewer trees could mean more sunshine, and while many orchids like sunshine, the vast majority don’t appreciate constant sunshine. The species in the Amazon rainforest certainly won’t because they are not used to constant sunny conditions. Also, the effects of fewer trees in the Amazonian rainforest on the humidity and the temperature, two other important factors in maintaining orchids, would be uncertain, but it’s likely that there would be considerable changes, which would have a detrimental effect on these orchids. The temperatures would be likely to rise with less tree cover on the ground, allowing more sunlight to enter. The humidity would also rise, and while orchids require high humidity, it is usually in the 60-85% level, the typical range of the Amazon rainforest. If the humidity climbs higher than it is now, it is very likely that the orchids will not thrive in the Amazon rainforest as they are now. Therefore, the development of the microchip technology to keep track of how many trees are being felled legally and illegally will not only benefit the trees themselves, but all plant life in the rainforest, including orchids. What do you think about this issue? Please submit a comment below. Have other questions about orchids? Here are the Top 5 FAQs About Orchid Care. No matter how hard we try to stop it !